The browser window consists of a folder tree and a thumb grid. This is similar to the layout used by Windows Explorer. 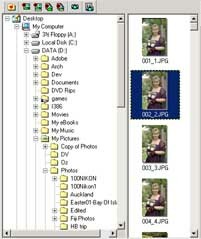 The folder tree is used to navigate the computer. Selecting a folder will display the printable files in the thumb grid. Selecting one of the entries from the 'Browser' menu ('Add ...'). Using one of the toolbar buttons marked with a '+'. Right clicking on an image and selecting an option from the context menu. Frequently used folders can be saved using Favorites. The browser pane can be shown (or hidden) using the 'Show Browser' option on the 'View' Menu. The position of the thumb grid can be changed in the User Interface page of the options dialog.